It’s a shame Mr. Clooney followed up his passion project “Good Night, and Good Luck” with such a drab, uninteresting Coen-wannabe romantic comedy. Like we’ve seen the Coen Bros do time and again, Clooney attempts to make a classic throwback screwball comedy, a la, Preston Sturges, Frank Capra, Leo McCarey - think “Hudsucker Proxy” meets “Intolerable Cruelty”, meets “O Brother Where Art Thou?” We just don't make comedies the way we used to, and rekindling someone's else's magic rarely ever works. 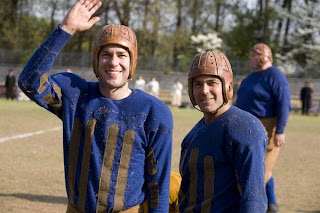 Clooney plays Jimmy "Dodge" Connelly, a professional football player in the 1920's. Pro football then is not quite the same as the NFL today. Amateur sport was the top tier of athletic entertainment in those days. And we see this contrast via college star Carter Rutherford (John Krasinski). After Rutherford's completes his star junior season he's courted by Connelly to play for his Duluth Bulldogs. Rutherford's war-hero status and poster-boy public charm is the ideal star to lift the hapless professional league into respectability. Then along comes Lexie Littleton (Renee Zelwegger) - think Jennifer Jason Leigh doing her Katherine Hepburn impression in "The Hudsucker Proxy" - a career-climbing news reporter who desires to expose some dirt on the unblemished Rutherford. Carter courts Lexie, who then confesses a dark secret about his war record. Meanwhile Connelly just can't help sparking a relationship with Lexie, which causes Rutherford to quit the team threatening the league. Connelly and Rutherford settle their score on the football field. The film doesn’t make a strong enough statement or hit any comedic or emotional buttons needed to elevate the film beyond its handsome production design. As a sports film, it’s nil. Sure, there’s no stakes in the big game other than pride, but the main opportunity missed was to show how the success of the modern game is due to the actions of the characters in the "Leatherheads" era. Clooney could have examined the debate of professional vs. amateur sports, and it's issues with gambling, but Clooney barely breaks this surface. Instead much screentime is devoted to the controversy of Rutherdford's war record. Again, Clooney barely scratches the surface emotionally and so without comedy or substantial drama these scenes deflate any excitement. Clooney seems to rest on the nostalgia of the era to maintain our interest. The film is dripping in 20’s décor. We can even catch a slight smirk of enjoyment on Clooney's face when he’s driving his vintage convertible car. The film is beautifully designed, framed and lit, and the football scenes bristle with authenticity. But who really cares without a substantial story to either engage in, or learn from. None of the personal passion Clooney demonstrated with "Good Night, and Good Luck" or even the flawed "Confessions of a Dangerous Mind" comes across with "Leatherheads". We don't even get the sense that Clooney loves football. I've heard basketball's his sport. Clooney as James Naismith might have produced something worthy and distinct of this megastar who can afford to pick and choose his projects.